Easily tweak the Unity desktop with 'GUnity' - OMG! Ubuntu! 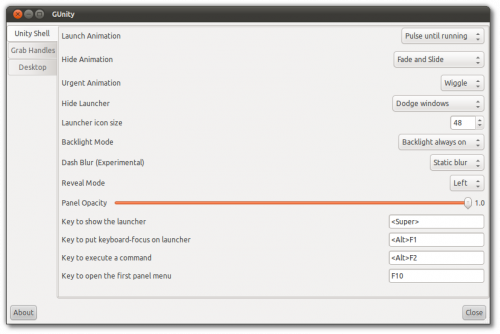 ‘Gunity’ provides easily-accessible options for tweaking aspects of the Unity interface without the need to install Compiz Configuration Settings manager, wade through dconf settings or apply scripts. Support for tweaking various� parts of the Unity interface – such as Unity Launcher size, shortcuts, Launcher behaviour, etc – is not readily accessible in Ubuntu ‘out of the box’. One can install the ‘Compiz Config Settings Manager’ to adjust many of these or, now, via ‘GUnity’ – a standalone application that puts many of Unity’s tweakable features under one window. GUnity can be downloaded in .deb format at blog.ckdevelop.org. Users should be cautious when installing .debs form non-trusted sources.